The Chief Ministers of West Bengal and Sikkim Mamata Banerjee and Pawan Chamling, who had a somewhat strained relationship in the recent past, met on Friday to resolve their differences. After the meeting, they declared they have overcome all differences and will now work towards the development of both states. The Supreme Court's order on the arrest of former Gorkhaland Territorial Administration chief Bimal Gurung strengthened West Bengal's case as Sikkim had been supporting the Gorkha leader. According to the Sikkim CM, “There were differences of opinion in the past , but now we have resolved all issues". Sources in the All India Trinamool Congress said that the meeting was also aimed at ensuring that no further disturbances take place in the Darjeeling hills. Goutam Deb, minister in charge for the development of North Bengal, said "The first thing an industrialist needs is a peaceful atmosphere. For that CM Banerjee is taking all the necessary measures to establish peace in Darjeeling and ensure that people and industrialists face no problems there". 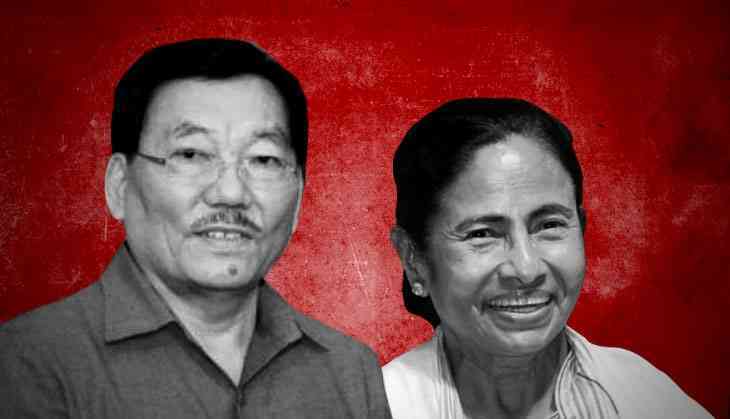 It may be mentioned that the West Bengal government's relations with the Chamling regime soured last year after the Sikkim chief minister expressed displeasure at the way the Trinamool government handled the Gorkhaland agitation . In June, the Gorkha Janmukti Morcha (GJM) renewed its demanded for a separate Gorkhaland. The hills were shut down for more than a month amid violence. Eventually the Army had to be deployed in Darjeeling to restore peace. However later, Banerjee succeeded in bringing the situation under control.